Bleeding during the first trimester of pregnancy is common. Although usually of no permanent consequence, it can be a sign of complication, such as a threatened abortion or a failed intrauterine pregnancy, or other serious pathology, such as ectopic pregnancy or gestational trophoblastic disease. Familiarity with the imaging patterns of these entities is important, as misdiagnosis can lead to harm to the mother, fetus, or both. This review will focus on the most common causes of bleeding in the first trimester, their imaging appearances, and diagnostic algorithms. 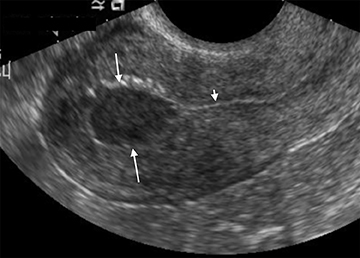 Ultrasound images can be obtained via transabdominal or endovaginal approaches; usually both are utilized in tandem. Transabdominal scanning is usually obtained first, with a lower-frequency curved or vector transducer, typically 4-6 MHz. This provides a large field of view, optimal to demonstrate large or widespread processes such as large adnexal masses or hemoperitoneum. Endovaginal US is usually required for a more detailed evaluation of the uterus and ovaries. Endovaginal probes utilize a higher frequency, typically 8-10 MHz, yielding increased resolution at the expense of less tissue penetration. 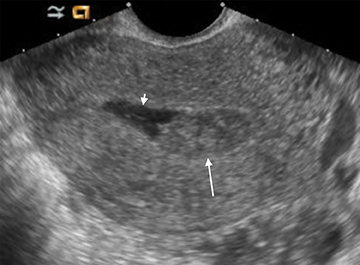 Because accurate measurements of early gestational processes are crucial, endovaginal imaging should be utilized whenever possible. For this review, all size references are based on endovaginal measurements unless otherwise specified. Although the first trimester begins at the first day of the last menstrual period, fertilization occurs approximately two weeks later, marking the beginning of the conceptus period of the first trimester (3-5 weeks menstrual age). 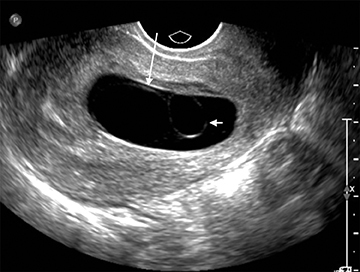 Implantation of the blastocyst into the endometrium occurs during the fourth menstrual week, at which point the endometrium is referred to as the decidua.2 During this time the very early chorionic sac may be visible as a small fluid-filled sac with an echogenic rim located eccentrically within the endometrium, known as the “intradecidual sign” (Figure 1).3 This can be seen as early as 4.5 weeks, and is nearly 100% specific for an intrauterine pregnancy (IUP), although it is only 60-68% sensitive.4 This precedes the “double decidual sign,” which consists of two concentric echogenic rings: the decidua capsularis surrounding the gestational sac, and the decidua parietalis representing the opposite wall of the endometrium, often separated by a thin collection of fluid within the endometrial cavity (Figure 2).5 As with the intradecidual sign, the double decidual sign is highly specific but insensitive; furthermore, a yolk sac may be visible before this sign is apparent, making it less useful in confirming an early IUP. 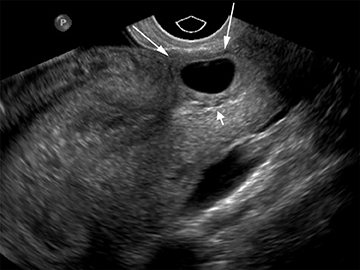 Importantly, one should differentiate these two early signs of an IUP from a fluid collection within the endometrial canal, the “pseudo-gestational sac” (Figure 3). The yolk sac is the first structure able to be visualized within the early gestational sac (chorionic sac), usually by the time the mean gestational sac diameter (MSD) is 8-10 mm (Figure 4).6 A normal yolk sac is always less than 6 mm in diameter; a yolk sac greater than 6 mm is nearly 100% specific for an abnormal pregnancy.7 Shortly following appearance of the yolk sac, the embryo is usually apparent at approximately 6 weeks, when the MSD is greater than 16 mm, as a small echogenic structure along one side of the yolk sac. Cardiac activity can usually be identified by the time the embryo is visible. In the absence of visualization of any of the above in the setting of a positive urine or serum β-hCG, the pregnancy should be considered a pregnancy of unknown location, or PUL. Familiarity with the specific US criteria for diagnosing a failed or anembryonic pregnancy (“blighted ovum”) (Figure 6) is essential. The traditionally taught size discriminatory thresholds for declaring an abnormal pregnancy have been called into question,10 and the Society of Radiologists in Ultrasound has subsequently adopted revised criteria; the results of their consensus conference statement have recently been published.11 In brief, a major reason for the updated criteria was to increase the specificity of the imaging diagnosis of a failed IUP to prevent the unwanted termination of very early but potentially viable pregnancies. The traditional radiologic teaching has been a “multiple of 5’s” rule: 1) a yolk sac should be visible when the mean gestational sac diameter (GSD) is >10 mm; 2) an embryo should be visible when the mean GSD is >15; and 3) a heartbeat should be present when the crown rump length (CRL) of the embryo is >5 mm. While likely indicating an abnormal pregnancy, they are not specific. Strict adherence to these criteria will uncommonly result in the false diagnosis of a failed pregnancy when in fact there is a potentially viable pregnancy that could be harmed by intervention. The revised criteria for diagnosing pregnancy failure are as follows (Table 2).11 Note the increase in CRL and mean GSD size thresholds, below which a failed pregnancy should not be diagnosed. One of the most important new concepts is that the diagnosis of a failed pregnancy should not be made based on a single elevated β-hCG measurement in the setting of a PUL. Normal pregnancies can develop subsequent to an ultrasound without an IUP and β-hCG greater than the traditional discriminatory threshold of 2000 or even 3000 mIU/mL.12,13 Therefore, the diagnosis of a failed or ectopic pregnancy should never be based on a single β-hCG measurement in the absence of definitive US findings. Ectopic pregnancy accounts for 2% of all pregnancies, as last reported by the U.S. Centers for Disease Control and Prevention in 1992.20 The incidence is higher in patients with a history of prior ectopic pregnancy, tubal disease, presence of an intrauterine device, and in those undergoing in vitro fertilization.21 The classic clinical triad is pain, bleeding, and adnexal mass; however these are present only in a minority of cases. The vast majority of ectopic pregnancies occur within the fallopian tube (tubal ectopic). Less common locations include interstitial (cornual), cervical, within a cesarean section scar, or ovarian. Occasionally, the only US finding will be free fluid. Visualization of a live embryo outside of the uterine cavity is 100% specific for ectopic pregnancy, but is rarely encountered in practice. More often, an adnexal tubal ring is identified. 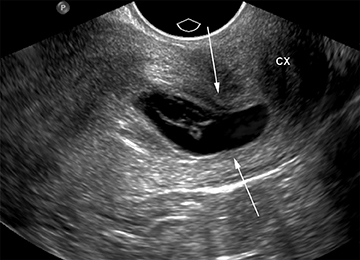 On US this consists of an echogenic ring with central fluid, separate from the ovary. The ring may or may not contain a yolk sac or embryo. 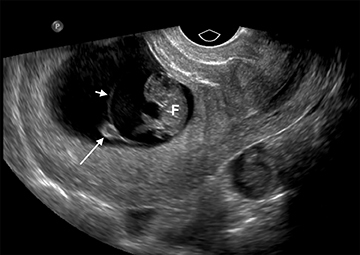 The ring is typically more echogenic than the ring of a corpus luteum, with which it can potentially be confused (Figure 9).22,23 Distinguishing between the two is vital, as the misdiagnosis of a corpus luteum as an ectopic pregnancy in the setting of PUL can have tragic consequences. 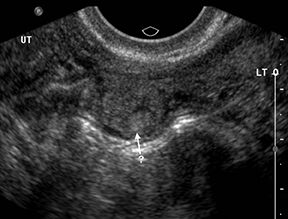 Endovaginal transducer pressure on the ovary can help determine if the lesion is within or separate from the ovary. 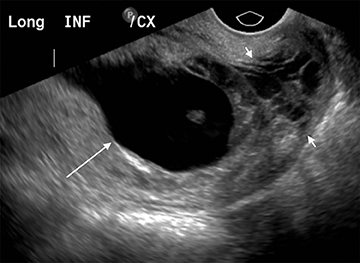 As ovarian ectopic pregnancies are exceedingly rare, demonstrating an intra-ovarian location confirms a corpus luteum and essentially excludes an ectopic mass. 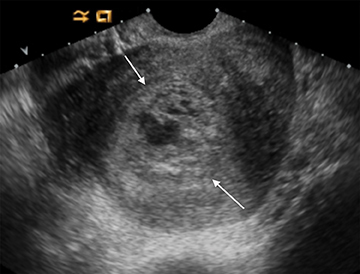 Often, the ectopic may be identified only as an extra-ovarian adnexal mass, without the classic ring-like appearance, because of hemorrhage. 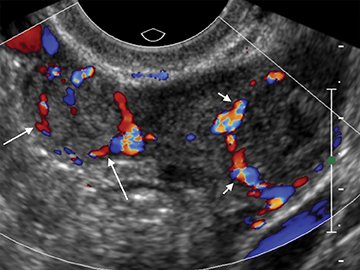 While the presence of color flow helps to confirm an ectopic pregnancy mass, the converse is not always true. 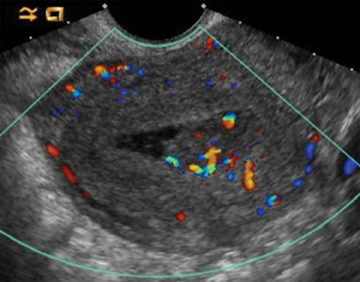 Not all ectopics are vascular, and the absence of color Doppler flow does not exclude an ectopic pregnancy. While large amounts of hemorrhage typically indicate a ruptured ectopic, occasionally a ruptured hemorrhagic cyst can present with a similar clinical and US picture. When an ectopic pregnancy implants within the interstitial segment of the fallopian tube, it is termed an interstitial (or cornual) ectopic. These can be mistaken for IUP if not fully investigated, as they can have a normal interface with the endometrium along their inner margin. Additionally, the distinction from tubal ectopics is important, as cornual pregnancies have an increased risk of severe hemorrhage and mortality. Pregnancies implanted at the cesarean section scar site frequently result in spontaneous miscarriage (44%), but are at increased risk of developing placenta previa and placenta accreta if they develop later into pregnancy, and are associated with increased risk of severe hemorrhage at delivery.30 Diagnosis is easier to establish in the first trimester, when there is an empty uterine cavity, a gestational sac implanted anteriorly at the level of the cervical os or at the visible or presumed cesarean section scar site, and perigestational Doppler flow (Figure 13). Ectopic pregnancy can be managed medically or surgically. 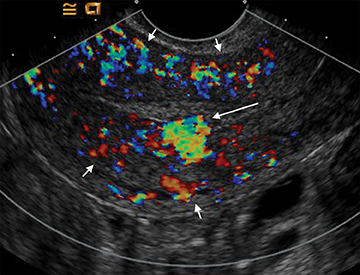 Imaging features that influence management include the size of the ectopic; presence of embryonic cardiac activity, pelvic hemorrhage or tubal rupture; and the location of the ectopic. Nonsurgical techniques include systemic methotrexate or ultrasound-guided local injection of methotrexate or KCl. For tubal ectopics, salpingostomy or salpingectomy may be performed. Interstitial ectopics may require cornual resection or hysterectomy. Cesarean section or cervical ectopics may require a combination of medical and surgical therapy. There is frequently overlap in the ultrasound appearance of AVMs and RPOC, and the distinction is not always possible. RPOC tend to be located within the endometrium, with AVMs in the myometrium; however, the presence of heterogeneous blood within the endometrial cavity can obscure the myometrial margins or mimic RPOC. Clinical history and serum β-hCG are helpful in differentiating these two entities. The distinction between non-invasive mole and invasive mole/choriocarcinoma is not always possible with US. In contrast to hydatidiform moles, invasive moles and choriocarcinomas demonstrate color flow on Doppler, with low-impedance waveforms (Figure 17).35 Invasive moles grow deep into the myometrium, sometimes with penetration into parametrial tissues and peritoneum, but rarely metastasize. 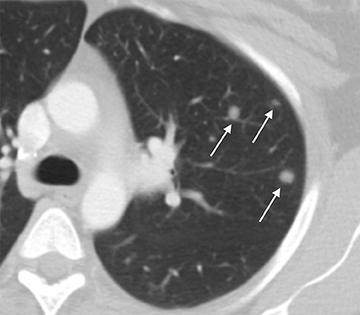 In contrast, choriocarcinoma readily metastasizes to the lungs and less frequently the pelvis,17 for which CT is useful (Figure 18). 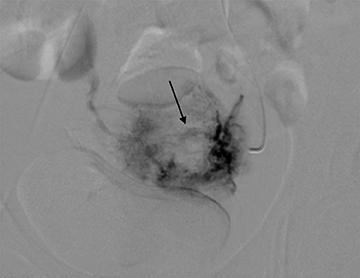 Magnetic resonance imaging may aid in evaluating persistent residual disease in the pelvis. 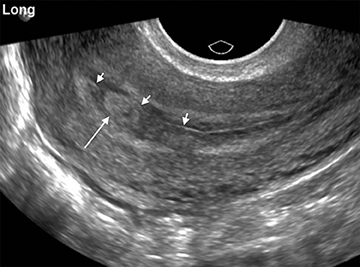 Ultrasound can readily distinguish the most common causes of vaginal bleeding in early pregnancy, and plays an essential role in patient management. Familiarity with the US appearance as well as new guidelines is essential to avoid causing potential harm to the mother or developing fetus. Lane BF, Wong-You-Cheong JJ, Javitt MC, et al. 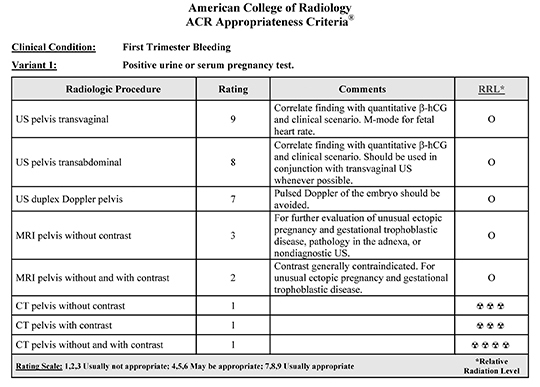 ACR Appropriateness Criteria® First Trimester Bleeding. Available at http://www.acr.org/~/media/ACR/Documents/AppCriteria/Diagnostic/FirstTrimesterBleeding.pdf. American College of Radiology. Accessed April 28, 2014. Gupta N, Angtuaco TL. Embryosonology in the first trimester of pregnancy. Ultrasound Clinics. 2007; 2:175-185. Yeh HC. Sonographic signs of early pregnancy. Crit Rev Diagn Imaging. 1988; 28:181-211. Chiang G, Levine D, Swire M, et al. 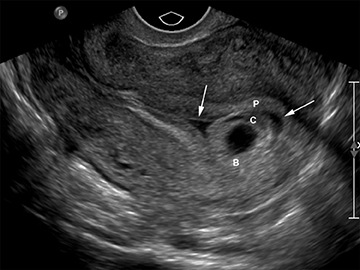 The intradecidual sign: Is it reliable for diagnosis of early intrauterine pregnancy? AJR Am J Roentgenol. 2004;183:725-731. Bradley WG, Fiske CE, Filly RA. The double sac sign of early intrauterine pregnancy: use in exclusion of ectopic pregnancy. Radiology.1982;143:223-226. Nyberg DA, Mack LA, Laing FC, Patten RM. 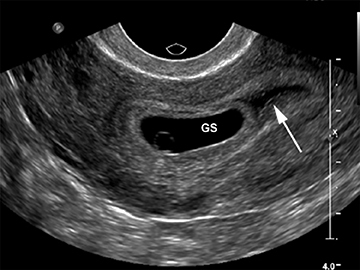 Distinguishing normal from abnormal gestational sac growth in early pregnancy. J Ultrasound Med. 1987;6:23-27. Stampone C, Nicotra M, Muttinelli C, Cosmi EV. 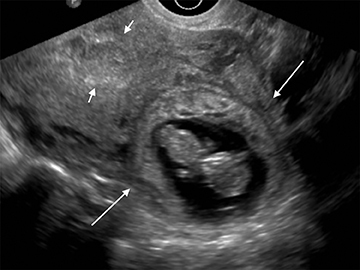 Transvaginal sonography of the yolk sac in normal and abnormal pregnancy. J Clin Ultrasound.1996;24:3-9. McKenna KM, Feldstein VA, Goldstein RB, Filly RA. The empty amnion: A sign of early pregnancy failure. J Ultrasound Med. 1995; 14:117-121. Coady AM. The first trimester, gynaecological aspects. In: Allan PL, Baxter GM, Weston MJ, eds. Clinical Ultrasound. 3rd ed. Edinburgh: Churchill Livingstone; 2011:740-769. Abdallah Y, Daemen A, Kirk E, et al. Limitations of current definitions of miscarriage using mean gestational sac diameter and crown-rump length measurements: a multicenter observational study. Ultrasound Obstet Gynecol. 2011;38:497-502. Doubilet PM, Benson CB, Bourne T, Blaivas M, et al. Diagnostic criteria for nonviable pregnancy early in the first trimester. N Engl J Med. 2013; 369:1443-1451. Doubilet PM, Benson CB. Further evidence against the reliability of the human chorionic gonadotropin discriminatory level. J Ultrasound Med. 2011; 30:1637-1642. Mehta TS, Levine D, Beckwith B. Treatment of ectopic pregnancy: is a human chorionic gonadotropin level of 2,000 mIU/ml a reasonable threshold? Radiology.1997;205:569-573. Hasan R, Baird DD, Herring AH, et al. Patterns and predictors of vaginal bleeding in the first trimester of pregnancy. Ann Epidemiol. 2010; 20:524-531. Nyberg DA, Laing FC. Threatened abortion and abnormal first trimester intrauterine pregnancy. In: Patterson AS, ed. Transvaginal ultrasound. St. Louis: Mosby-Year Book, 1992: 85-103. Bennett GL, Bromley B, Lieberman E, Benacerraf BR. Subchorionic hemorrhage in first-trimester pregnancies: prediction of pregnancy outcome with sonography. Radiology. 1996; 200:803-806. Dighe M, Cuevas C, Moshiri M, et al. Sonography in first trimester bleeding. J Clin Ultrasound. 2008; 36:352-366. Nagy S, Bush M, Stone J, et al. Clinical significance of subchorionic and retroplacental hematomas detected in the first trimester of pregnancy. Obstet Gynecol. 2003; 102:94-100. Borlum KG, Thomsen A, Clausen I, Eriksen G. Long-term prognosis of pregnancies in women with intrauterine hematomas. Obstet Gynecol. 1989; 74:231-233. Centers for Disease Control and Prevention (CDC). Ectopic pregnancy--United States, 1990–1992. MMWR Morb Mortal Wkly Rep. 1995; 44:46-48. Levine D. Ectopic pregnancy. Radiology. 2007; 245:385-397. Frates MC, Visweswaran A, Laing FC. Comparison of tubal ring and corpus luteum echogenicities: a useful differentiating characteristic. J Ultrasound Med. 2001; 20:27-31. Stein MW, Ricci ZJ, Novak L, et al. 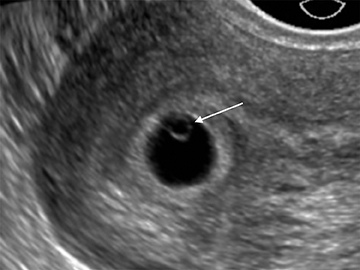 Sonographic comparison of the tubal ring of ectopic pregnancy with the corpus luteum. J Ultrasound Med. 2004; 23:57-62. Chen GD, Lin MT, Lee MS. Diagnosis of interstitial pregnancy with sonography. J Clin Ultrasound. 1994; 22:439-442. Graham M, Cooperberg PL. 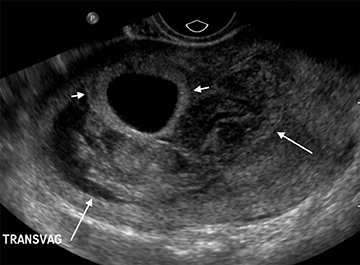 Ultrasound diagnosis of interstitial pregnancy: Findings and pitfalls. J Clin Ultrasound. 1979; 7:433-437. Ackerman TE, Levi CS, Dashefsky SM, et al. 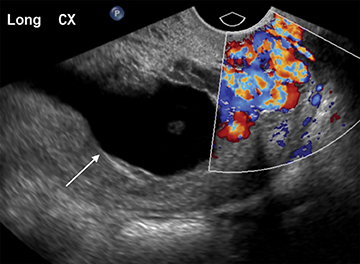 Interstitial line: sonographic finding in interstitial (cornual) ectopic pregnancy. Radiology. 1993;189:83-87. Jurkovic D, Hacket E, Campbell S. Diagnosis and treatment of early cervical pregnancy: a review and a report of two cases treated conservatively. Ultrasound Obstet Gynecol. 1996; 8:373-380. Vas W, Suresh PL, Tang-Barton P, et al. 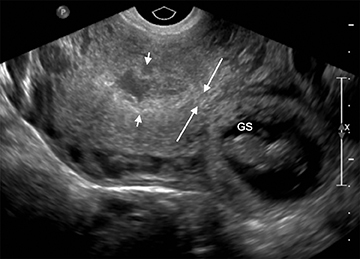 Ultrasonographic differentiation of cervical abortion from cervical pregnancy. J Clin Ultrasound. 1984; 12:553-557. Kakaji Y, Nghiem HV, Nodell C, Winter TC. Sonography of obstetric and gynecologic emergencies: part I, obstetric emergencies. AJR Am J Roentgenol. 2000; 174:641-649. Jurkovic D, Hillaby K, Woelfer B, et al. First-trimester diagnosis and management of pregnancies implanted into the lower uterine segment Cesarean section scar. Ultrasound Obstet Gynecol. 2003; 21:220-227. Brown DL. Pelvic ultrasound in the postabortion and postpartum patient. Ultrasound Q. 2005; 21:27-37. Polat P, Suma S, Kantarcy M, et al. 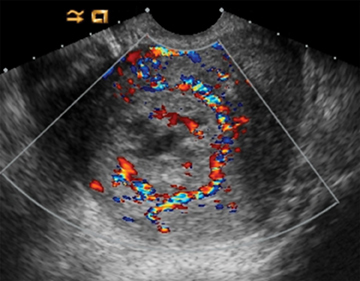 Color Doppler US in the evaluation of uterine vascular abnormalities. Radiographics. 2002;22:47-53. Hou JL, Wan XR, Xiang Y, et al. Changes of clinical features in hydatidiform mole: analysis of 113 cases. J Reprod Med. 2008;53:629-633. Green CL, Angtuaco TL, Shah HR, Parmley TH. Gestational trophoblastic disease: a spectrum of radiologic diagnosis. Radiographics. 1996; 16:1371-1384. Zhou Q, Lei XY, Xie Q, Cardoza JD. Sonographic and Doppler imaging in the diagnosis and treatment of gestational trophoblastic disease: a 12-year experience. J Ultrasound Med. 2005; 24:15-24. 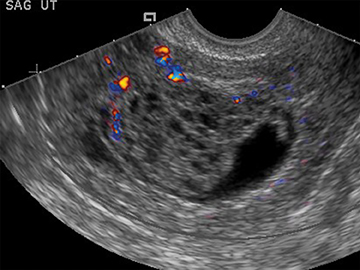 Imaging of vaginal bleeding in early pregnancy. Appl Radiol. Dr. Lane and Dr. Wong-You-Cheong are with the Department of Diagnostic Radiology and Nuclear Medicine at the University of Maryland School of Medicine, Baltimore, MD.